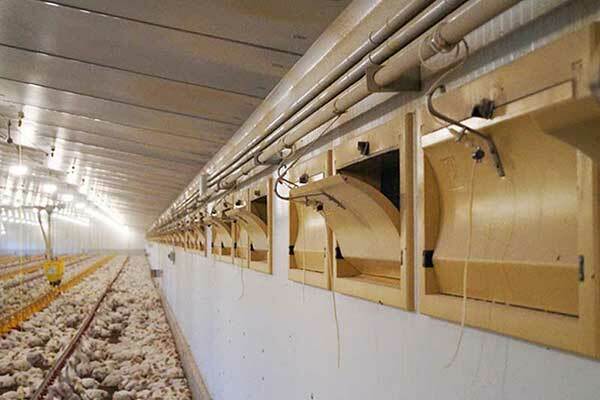 We travelled all the way to Fuente Obejuna – a village in Córdoba famous for the historical events of the fifteenth century that inspired the play Fuenteovejuna by Lope de Vega – to visit the new poultry facilities with transverse ventilation system, a “rara avis” in the poultry sector. These modern and efficient facilities are a turnkey project developed by Gandaria, a division of the Silos Córdoba group. The Galas-Caballero farm is managed by Rubén and María Gracia, a young couple who found in poultry farming a very worthy and profitable way to make a living in this famous Cordovan town. My wife and I thought the broiler chicken production was a good way to earn a living without having to emigrate and leave town. Moreover, her family work on the broiler production field and recommended us GANDARIA for this project. When the family experience helps you decide. Maria’s brothers have spent many years in poultry farming and have motivated Maria and Rubén to join the sector. “It’s not easy to get a job in this area so my brothers-in-law encouraged me to start a poultry farming business. With their help, together with Gandaria’s technical advice, we can now count on a a very efficient and profitable facility and earn a living without leaving our town”. They started this new challenge with the aim of earning a living and they had the chance to count on their family and GANDARIA’s support. Rubén explains that once they decided to develop this project, he visited several farms to help him choose which installation company to use. He then realised that the facilities by GANDARIA seemed to be the best ones. Likewise, his brothers-in-law highly recommended this company due to the high quality of their materials, finishings and customer service. “GANDARIA makes you feel that the facilities are also theirs, they help you, they support you and they make regular visits to make sure everything goes well. My brothers-in-law also told me that if there is a problem you just have to call them and they’ll solve it quickly. This is really reassuring when you invest so much money in a project of this type”. The land has been given by María Gracia’s parents and, once they had satisfied all bureaucratic requirements, they started to build the facility. “GANDARIA built a fantastic facility in less than three months, with spectacular finishes and fully prepared to start raising chickens”. Ruben tells us that his brothers-in-law are very satisfied with GANDARIA’s facilities and that this tipped the balance when they had to choose a company. The company’s consultation and after-sales service, the product’s finishings and the responsibility of workers made this company the perfect choice. These days, we find less and less facilities with transverse ventilation in our sector. Some believe it is about efficiency and others that it is a matter of fashion, but the reality is that there is a lot of talk about it in the sector. 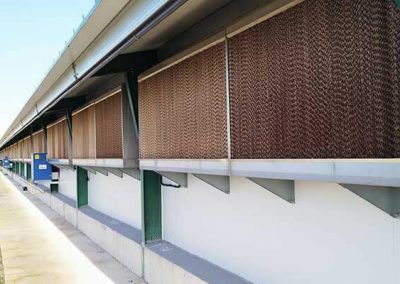 The company offered Rubén several types of ventilation for this facility, but he chose transverse ventilation. “In Córdoba, if you have good management, take care of your animals and commit to your farm, a transverse ventilation system is a very good choice”. Once they start a project, GANDARIA offers a wealth of advice and they adapt to the farmer’s project. In this case, they wanted a porch, a warehouse and, after consultation with GANDARIA, they were able to develop the design of the facility according to their needs. The facility has a functional size of 155m by 15 wide. In addition, they have incorporated a twin technical rooms with porch. 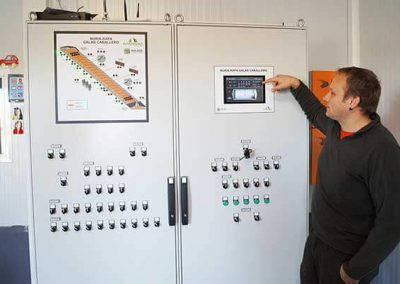 One of them is used as technical room itself and the other houses the water tank, the generator and other tools for the proper operation of the facility. “There are two crucial factors in this business, which are fully satisfied by GANDARIA. First of all, we have the finishings, that add a lot of value and secondly, our reliability. It’s not nice to chase people to get things done, and you can rely on Vicente Peña from GANDARIA”. 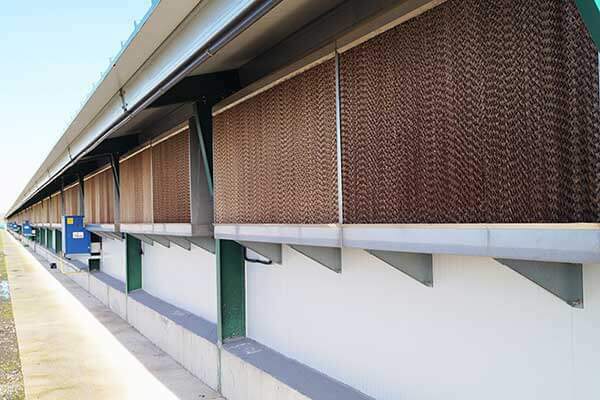 We can find 9 large and 10 small fans on the side of the facility for the transverse ventilation system. The air enters through the side windows and exits through the fan. The 123 windows on one of the sides for the air intake are very resistant and avoid air turbulence ensuring proper ventilation. 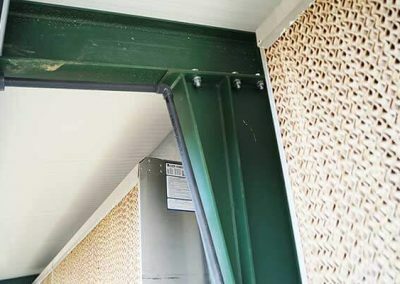 Large fans are sealed with a perfectly watertight gate and weather stripping that prevents the transfer of energy, which ensures the insulation and avoids the entry of air with the minimum ventilation. The fans, manufactured by GANDARIA are made with a special sheet with an alloy of zinc, magnesium and aluminum that makes them 10 times more resistant to environmental corrosion than other fans of the same type. In addition, they feature an energy-efficient engine that complies with current regulations. The new facility is characterised by its perfect insulation, completely sealed, with no thermal bridges. 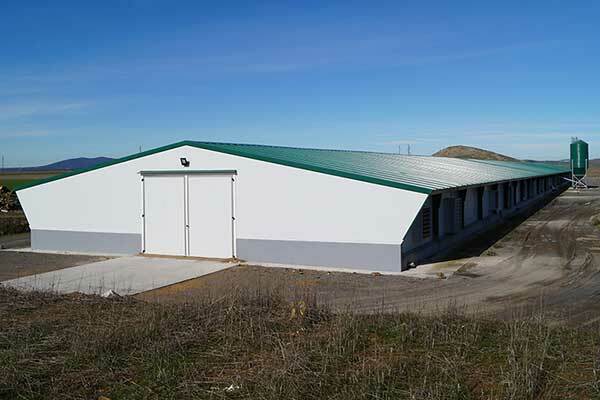 The sandwich panels on the side walls are 5mm thick and on the roof we find a false ceiling with 30-30mm double sandwich panels that guarantee the correct sealing of the facility. 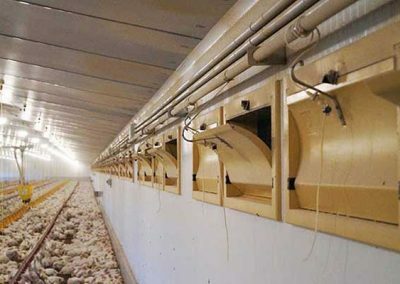 The double insulation (30-30), added to the air chamber, enables that the heat prevailing most of the time in this area does not affect the correct development of the chickens. 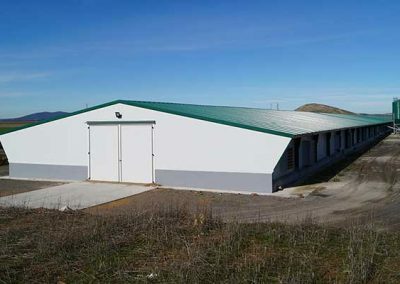 The distribution of materials guarantee energy efficiency in summer as well as in winter, “investing in a properly designed and isolated facility helps you save energy in the short-medium term”. 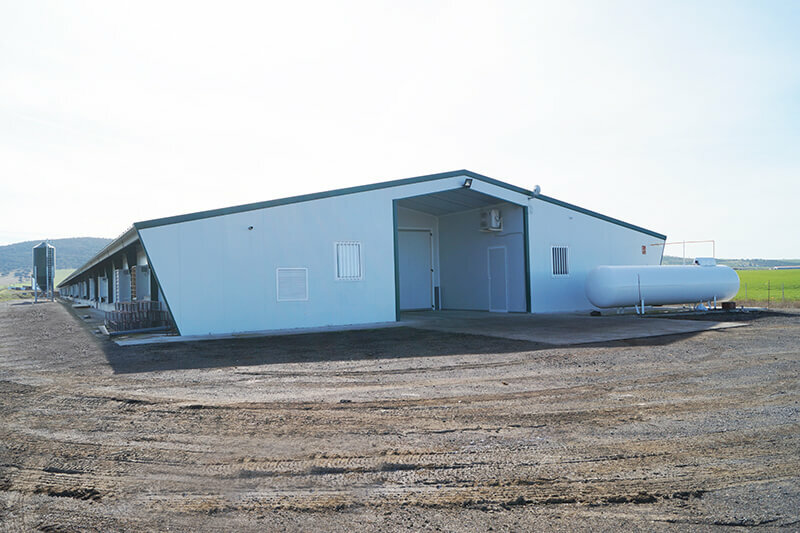 The company points out that they always consider the weather conditions of the farm location to propose the farmer the most appropriate type of insulation. The gates are refrigerated doors, so tightness is guaranteed. 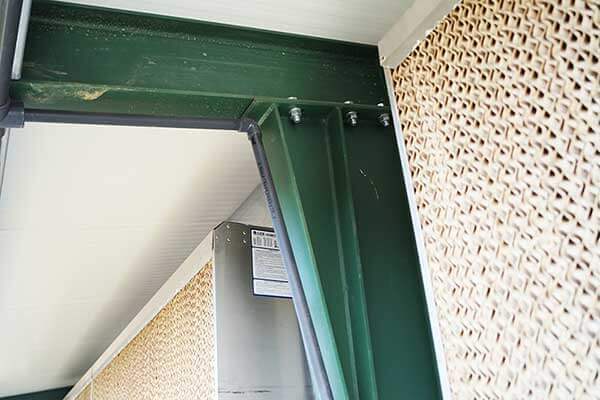 They have aluminum frames and a sandwich panel that prevents the creation of thermal bridges. Ruben and his wife have experienced 5 fattening periods in these facilities and are very happy with the results and with the GANDARIA’s facility, that is tight and everything works perfectly. Rubén works in integration for SADA and up to now they make selections at the end of the fattening period, so they divide the facility with a net to separate the animals. 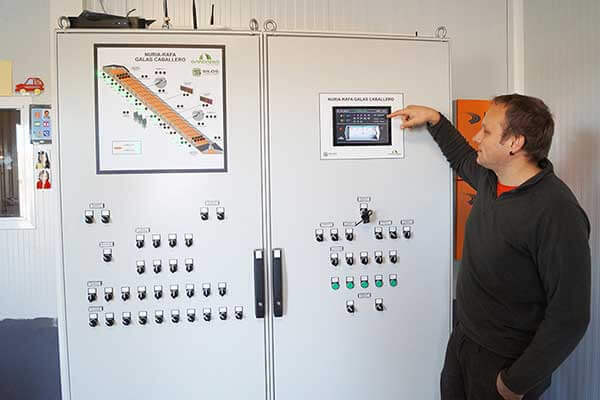 The integrator makes them work under very high biosecurity conditions and at this point he is also very happy with the design and distribution of the farm. “GANDARIA has built a facility that complies with all the biosecurity requirements. Besides, it is very easy to clean when we make the sanitary vacuum, the materials are very resistant and the design of the facility is very suitable. We can find multi-age feeders that can be used from the beginning until the end of the fattening process. In addition, the facility features aluminum frame teats with collector. The elevation of the feeders and drinkers is automatic, which facilitates handling operations during the fattening process and during the sanitary vacuum. The environmental control is managed by an automaton that can be found in the technical room. This control automaton, along with numerous probes distributed throughout the facility, enable the perfect condition of the bed and help avoid problems due to wet beds. The lighting has also been carefully considered in this facility. 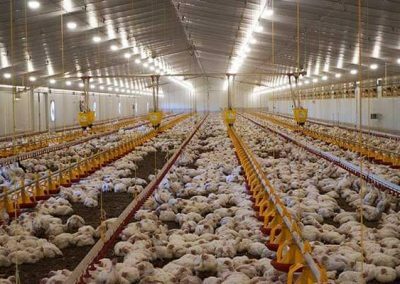 They have opted for led light adjustable from 0 to 100lux that does not produce any kind of shade and helps the chicken see the food correctly. There are four rows of lights that offer a great uniformity in the distribution of light. 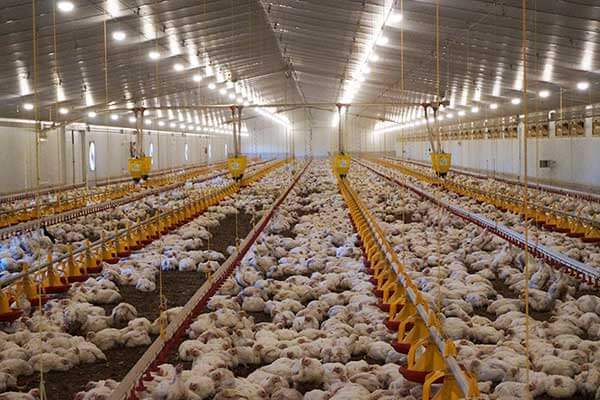 “The secret of a chicken house is the uniformity of temperature, humidity and lighting, apart from the fact of having enough feeers and drinking troughs so that the animals are properly distributed. But the most important of all is to handle it properly. In this point, my brothers-in-law and GANDARIA have helped a lot”. “I am delighted with the facility. It is not a 8 or 9 hours job, it requires a lot of perseverance, but I am very happy with the decision we have made. It is profitable if you dedicate time and commit to the farm. In the near future we want to expand and we will count on GANDARIA again.I have felt accompanied at all times and I feel very confident. I do not doubt it: I want to work with them again, and since GANDARIA see it as a shared project, you do not feel alone at any time.